I actually done this on an '96 F3 that I owned at the time, it may work on others and then it may not. I had made some custom LED front flush mount marker lights but I wanted them to be both running lights and turn signals without having to have a separate set of LED's for each function. It's easy to do, all you need is some wire, 4 diodes, solder and soldering gun/iron, wire connectors. 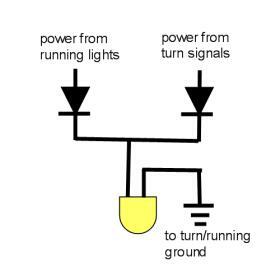 You have to have a diode on each wire (turn and running lights) that is directed toward the LED's. This will allow power to flow from each wire but not between the two wires. Now this worked fine on my F3 I'm not exactly sure about others. Here is the schematic drawing, feel free to use, copy or share. Turn Signal Switch Becoming Harder to Operate.